I see that a combined team of Manchester and York University archaeologists have uncovered Britain’s oldest house to date in the ever-more-fascinating Star Carr site near the seaside town of Scarborough in the North East of England. Julian Cope was referring to Star Carr many years ago, long before many people were even aware of its significance (check out his S.T.A.R.C.A.R. track off the Autogeddon album). Talking of album references – the title of my post is a passing reference to the title of The Fall’s latest album, which I recommend to anyone from Bury. I’m not from Bury. Back to the thin strand of information that I refer to as “the plot”. The plot thickens. This old house that they have dug up contained some well-preserved items in the trench that they sank into the coastal soil, and what they pulled out of the treasure trove were some interesting items, from a druid’s perspective. 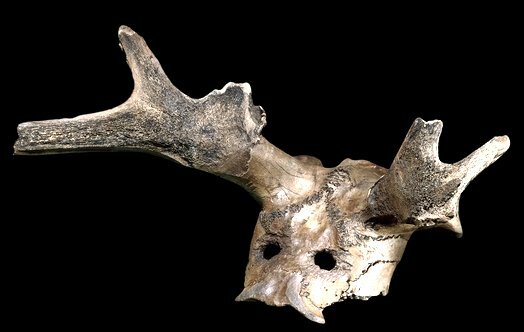 This dates the use of ritual antler horn headwear to around the age of 8,5000 B.C.E. That’s quite some precedence for a ritual that only recently dwindled in popularity! Some would say that it is still continued in the concept of the “stag” weekend that prospective grooms undergo throughout the northern hemisphere cultures. To me this backs up what a lot of Celtic shamanism writers have said about the rituals of early tribal shamans. It would appear that the rituals (that may have included dance, drumming, initiations and rituals) are about as old as the post-Ice Age human civilisations that began to re-establish themselves in the northern hemisphere after the retreat of the ice caps. Shamanism from the outset, it would seem. Magic at the heart of social life. The discovery of a large trunk from an old and sizeable tree shows us that the veneration for trees is also as old as the hills. Again, this reverence for trees hints at some form of shamanistic lifestyle, and who knows how long that lasted, for the Druids of these same islands carried those same items of devotion through into their history, such as we can understand it. We have no information yet as to what type of three it might be, but it would not surprise me that it was a yew tree, possibly one of the trees that symbolised the concept of The World Tree – the omphalos or navel, the central point around which a settlement was constructed. Rather than this being something left alone, it could have been the centre of attention. Just a thought.